Lau (centre), Wong (second left), Janet (fourth right) and others prick balloons to get the Family Day rolling. Time for everyone to show their patriotism for the country. SIBU: YMCA Camp Resort Sibu plans to have their own website to promote their activities and to woo visitors to their facility. Its president, Temenggong Vincent Lau, said YMCA (Young Men Christian Association) Sibu would have a “global” reach once it goes online. Met at the ‘Family Day’ for YMCA Sibu and KTS Club members at YMCA Camp Resort yesterday, Lau said it was about time to promote the peaceful and beautiful natural surroundings of the resort to an international audience. He added that facilities at the resort would be improved from time to time to ensure guests had fond memories of it. “When they have fond memories of the resort, they are likely to share their experiences among family members, relatives, friends and colleagues,” he said, adding that YMCA Sibu was open to constructive suggestions from the public on how to improve the resort. Lau assured that the charges imposed by the resort would be “very attractive and reasonable”. On a related matter, he said the resort had vacancy for an Event Manager to push its promotions. 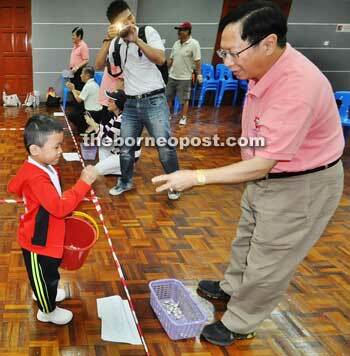 Present at the Family Day were YMCA Sibu director Wong Ei Sing and vice president Kapitan Datuk Janet Lau. The sporting Lau in action during a game.